UMC’s Flush Multi-Bolt Manhole Hatches are an inexpensive option for applications where frequent access to a compartment is not required. Ideal for tank top covers, fuel and water tank access, inspection access and more. These manhole hatches feature simple proven designs and are fabricated using high quality ASTM A36 Steel. 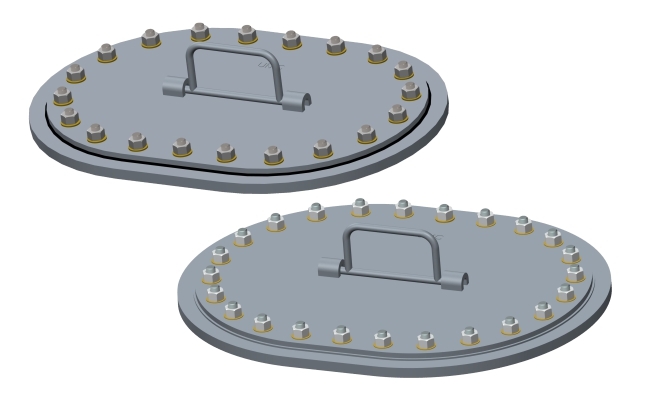 We offer various sized Oval Flush Manhole Hatches available with various hardware options in both weld bolt and flush screw types to meet your specific requirements.